We often forget that the frame is an essential element for the presentation and appreciation of a painting. It not only protects it and allows you to hang it on the wall, but, through a combination of form, processing and finishing, is a key contributor to the visual impact of the work. The period of the beginning of the seventeenth century until the late eighteenth century is considered the golden age of French frame. It is a time when the frame becomes an expression of both virtuosity, innovation, taste and wealth. The role of the sovereign leader of certain tendencies of taste becomes extremely important and his desire to surround himself with forms of furniture increasingly opulent stimulates creativity of brilliant designers and artisans with exceptional technical skills. The exhibition, realized with materials from the collections of the Getty Museum and the Getty Research Institute, presents a selection of objects representative of the taste of four French kings: the visitor is well styled yet relatively simple and inspired by Italian models of the time of Louis XIII (1610-1643), the decorative patterns more and more elaborate and imaginative processed during the reigns of Louis XIV (1643-1715) and during the regency of Philippe d’Orleans (1715-1723), to arrive at the peak of the technical processing and formal characteristic of the age of Louis XV (1723-1774), and end with a return to simplicity “classic”, largely inspired by the new prevailing taste for the old, during the reign of Louis XVI (1774-1792). 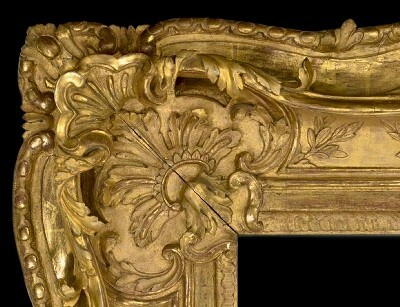 Next to picture frames “standard”, aimed at a market of collectors and enthusiasts growing, they have a number of unique and spectacular, outstanding commissions that represent the top of the inventiveness and techniques of French artisans of the time. Dear Reader, further information on this item awaits you by simply following this link . . . The exhibition link . . . This entry was posted in Arts / LifeStyle / Travel and tagged 17the century, 18th century, French frames, portrait, portrait frames. Bookmark the permalink.